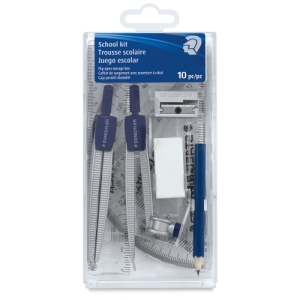 The Staedtler Math Set contains all the essential tools for math class in a handy storage box. The set is built around Staedtler's Norris Club 550 School Compass, a precision compass with integrated universal adapter and safety point — ideal for students' first circle-drawing exercises. ® STAEDTLER is a registered trademark.® Norris Club is a registered trademark. ® Mars is a registered trademark.